It’s challenging to know whether or not to trust your dog around children. It’s even harder yet to train your child and your dog to get along. Get more help training your aggressive dog with our affordable book, How to Stop Dog Aggression or through our self-study course, Keeping Kids Safe and Dogs Happy. I created the self-study course after I saw how many people read this post. It’s designed for parents and dog owners like you, who are worried about keeping their kids and dogs BOTH happy and safe. It’s incredibly in-depth, and it’s a great value! Recently, while visiting family, our 4-year-old Cavapoo became aggressive toward a 4-year-old niece and almost bit her. He really hasn’t been that way around kids before, after we have given him about 30 minutes or so to get used to them. He is a very sweet and lovable dog, but we cannot have this kind of behavior around little ones. What should I do? Manage the situation. Avoid children if your dog is aggressive towards children. Keep your dog on a leash and use fences or muzzles to prevent bites. Only allow child-dog interactions in fully supervised situations. Remember that management often fails. Teach children how to interact with dogs. Have a trainer help you teach your dog how to interact with children. Don’t shy away from hard conversations with qualified help if your dog is aggressive towards children. Check out our blog on Six Ways to Keep Kids Safe Around Dogs – it’s full of easy tips that will keep everyone safe! The most important thing when you don’t trust your dog around children is management. Management basically means controlling a situation to reduce risk. This simple concept is not always simple to act on. It’s also imperative to recognize that management almost always fails at some point. Hire a trainer (like me – I work remotely) if you have any concerns about a child’s safety. As you can see, none of these solutions involve training. They’re just avoiding dangerous situations. Management is an important first step to all training, especially when working with aggressive animals. Remember, your number one goal should be safety if your dog is aggressive towards children. The safety of Corky’s niece, the safety of her dog, and the safety of the adults around the child and the dog are the top priority. Strict management is imperative in situations like this. Dog owners need to remember that all dogs with teeth can and will bite. They don’t have to be aggressive, and it doesn’t mean they’re a bad dog. But all dogs can be pushed to bite, and keeping everyone safe is imperative. For example, my own dog was raised in a home with some small children. I’m still extremely cautious with children around him. Why? One of the worst things that could happen is to have my dog bite a child. So whenever there are kids around, I ask them to do something he likes – like throwing a frisbee – instead of petting him. I don’t allow children to hug or hang on my dog. If the children can’t listen, we leave. When we’re visiting cousins, I put Barley inside the crate with a puzzle toy in a separate, closed room if I can’t be watching him. This is to keep him happy and the children safe. Keep in mind that some dog bites are justified, and just because a dog bites, doesn’t mean he’s bad. In fact, sometimes the restraint a dog shows is a great sign! If your dog is aggressive towards children, he’s not necessarily a bad dog who can never live a safe and happy life. But he’s not trustworthy – so it’s your responsibility as an owner to avoid the situation again in the future. Management is the most important step for this. As a trainer, I always recommend strict management of dogs around children. But we have to remember that management often fails. People forget to close doors, you take your dog outside without a muzzle. That’s why management without training is often only half the battle. You can also teach your child to be safe around dogs – super important! The dog is an adult and doesn’t have regular exposure to children. This means that the small, fast-moving, loud child was probably very scary. 30 minutes of exposure is simply not enough time for a 4-year-old dog to become comfortable with the child. We don’t know how often this dog was exposed to children and how old those kids were. The entire situation was probably quite stressful. It sounds like the cavapoo was traveling and visiting family. While their dog might have looked excited, it’s quite likely that this was stressful for the dog. They were in a new place with strange people and a strange, loud, fast-moving creature. This is a lot for a dog to take in – it’s a ton of “new stuff” all at once! We don’t know what the child was doing when the dog reacted. My assessment of the situation changes based off of what the child was doing prior to the incident. In fact, we don’t know what was happening all around the dog. It’s one thing if the dog growled when the child pulled on her tail, stepped on her paw, or tried to pick her up. The situation is entirely another if the child walked by the dog and the dog snapped at her. It’s yet another if the dog was hiding under the table with a bone and the child crawled under the table to join her. Something happened prior to the dog becoming aggressive. What happened? We don’t know exactly what the dog was doing prior to nearly biting the child. I’m always interested in what the dog did leading up to the incident. Did the dog run away and hide? Did she back into a corner and then growl? What warning signs did she display? This pairs with red flag #3 – did the dog give warnings that the child (and the nearby adults) ignored or missed? Let’s use all of these red flags to explore a concept called Trigger Stacking. Trigger stacking is an important concept in dog training. The basic idea is this: people and dogs have a finite amount of patience and wherewithal at any given time. A series of mildly stressful events throughout the day can lead to an explosive result. This is often the case when people say that their dog “bit out of nowhere.” They probably missed some warning signs. They also probably missed a lot of tiny stressors leading up to the actual incident. I’ll illustrate this concept with a human example first. Imagine me, a young dog trainer, on a Tuesday. 5:49 am: I wake with a start. My alarm didn’t go off at 5:30, and now I have only 40 minutes before I need to leave for work if I want to be on time. 6:01 am: I rush out the door with Barley for his morning potty break. We run into the apartment complex’s resident reactive dog in the stairway. The dog barks, snarls, and lunges at Barley. Barley reacts well, but it’s not fun for either of us. 6:06 am: Barley poops. I reach for my poop bags and find that I’m all out. It’s ok – there’s a dispenser nearby. But it’s still irritating. 6:23 am: I’ve forgotten my keys. I have to call my boyfriend, who takes a while to get out of bed in order to come let me back into the complex. 6:31 am: I’m now late for work. I hop on my bike and pedal like mad, hitting all the wrong red lights on my way to work. 7:03 am: Only 3 minutes late. That’s not so bad. But there’s a volunteer using the staff clock-in area. Again. That’s really annoying. 7:42 am: I head out to work with the first dog of the day at work. He’s a high energy young Rottweiler. He spends the first 3 minutes of our session barking at me, the next 5 jumping on me painfully, and the next 10 yanking me around on the leash and refusing to eat treats. Our training session feels fruitless. 8:03 am: I get a call from my insurance company, who tells me that my last claim was through an out-of-network provider (it wasn’t) and I now owe $249 for my last appointment. Instead of calmly working through the misunderstanding, I scream at them and start sobbing. It’s only 8 am, and I feel like my day is ruined. I spend the remainder of the day on a knife’s edge, easily set off into anger, frustration, or tears by tiny annoyances. Now that’s trigger stacking. We’ve all been there. Days like this didn’t have one huge catastrophe. But the tiny problems throughout my morning led to me being an emotional wreck for the remainder of the day. The same can happen to our dogs. Let’s explore a hypothetical timeline of Corky’s cavapoo and her day. Forgive me for anthropomorphism. 8:00 am: Moms’ alarm goes off. Instead of taking me out for my morning walk, she spends her time packing. Our morning walk is much shorter than usual, and I don’t get to sniff as much as I’d like. Bummer. 8:30 am: Mom loads me up into the car. I like the car, but this isn’t our normal routine at all. Weird. 10:06 am: We arrive at a new home. Phew, that was a really long car ride. I’m a bit nauseous. 10:08 am: We go straight into this new home. My stomach hurts a bit. These new people are really loud and very excited. People keep petting me on the head and picking me up. I wish they’d just pet me under the chin or leave me alone. There’s this tiny human that is very loud and very fast-moving. I watch her carefully. She seems unpredictable. To try to calm myself down, I jump up all over the people and try to lick their faces. Maybe if I lick their faces and mouths, they’ll understand that I’m not a threat and leave me alone. 10:12 am: My owners keep bringing me back over to meet the tiny human. The tiny human moves too fast and pets me a bit too hard. Sometimes she puts her fingers in my fur and pulls a bit. I don’t like this, so I jump up to lick her face to try to appease her. 10:22 am: I wander away to another room and crawl under a table. It’s a bit quieter here, and I feel safe. It’s like a den. I start to lick my paws as a way to calm down. 10:06 am: The tiny human comes into the room and reaches under the table. I look away. She grabs onto my collar and starts making kissy sounds. I look back to her out of the corner of my eye and put my ears back. She keeps pulling. I growl a little bit. She keeps pulling. I lift my lips and growl louder. She really doesn’t seem to get it that I want to be left alone. At this point, my owners come in. They yell at me when they see me baring my teeth at the tiny human. Scared, I snap at her hand. Again, this is a total guess as to what happened in Corky’s cavapoo and her day. But if Corky’s cavapoo has never been around kids before, it’s a good guess that being around the kid was stressful. It’s also likely that visiting family is an unusual occurrence, so that’s stressful too. It’s also likely that Corky’s cavapoo was giving some sort of warning signs before she reacted to the child. We’ll talk more about warning signs below. Take note of how many times the cavapoo tries to diffuse the situation in this fake scenario. She licks faces. Corky hides under the table. She looks away. Corky whale eyes. She growls a little (big warning). Corky lifts her lips (huge warning). Then she gets yelled at – this makes the situation even more stressful. So she snaps. Get more help training your aggressive dog with our affordable book, How to Stop Dog Aggression or through our self-study course, Keeping Kids Safe and Dogs Happy. Again, I created both of these products with parents and owners like you in mind. After setting up a solid management protocol, it’s good to examine how the children behave around dogs. This is particularly important if your concern is a specific child. In this case, teaching the child how to be appropriate around dogs is more important for safety than teaching the dog how to be around children. Why? The child will interact with many other dogs in their lifetime, while your dog might only interact with the child. Keeping the child safe means teaching the child how to interact with dogs. If your concern is that your dog is aggressive towards all children, learn how to keep your dog away from children. You can educate the neighborhood kids, but it’s just not realistic to teach every single child how to safely interact with your dog. Management and training your dog is key in this case. Let me say it again. The first step in this process is setting up good management. This probably means starting out with a basic rule: no unsupervised interactions between the dog and the child. Period. Most dogs don’t like being hugged. Even worse, this close contact puts a nervous dog’s teeth very close to a child’s face. Teach your child to ask if they can pet the dog. Teach your child to pet the dog under the chin instead of over the head. Never, ever let your child pull on ears, tails, paws, or fur. Never let your child ride or hug the dog. Ever. Teach your child to stop petting the dog every 5 seconds. This gives you and the child opportunities to see what the dog does. Teach your child to let the dog leave if the dog wants to leave. These 6 steps are really important. All children should learn them and understand that these rules apply to all dogs. Yes, that even means your family labrador who loves children. It’s even more important for dogs that are unfamiliar with children, and children that are unfamiliar with dogs. 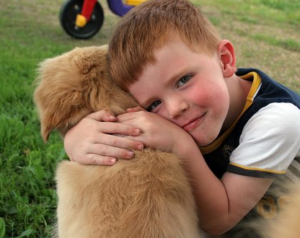 Children who interact safely with dogs are less likely to get themselves into trouble. It’s that simple. Teach your child to read some basic dog body language. My favorite resource for this is DoggieDrawings.net. I print out these posters for clients to hand on their refrigerators. Start out by teaching your child how to greet dogs politely. Adults and children should also learn how to tell the difference between a calm/relaxed dog and a shut down dog. Many people see a dog that’s lying down or showing its belly and think they’re relaxed. But there’s much more to it than that! A child who understands how to tell when a dog needs space is much less likely to be bitten. Whale eye and hiding are good signs that your dog needs a break. Lip licking. Dogs often lick their lips when they’re nervous, unsure, or uncomfortable. Looking away. 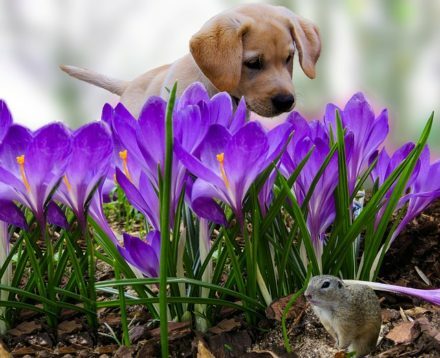 Dogs look away from situations to diffuse tension. Whale eye. This basically means looking at something from the corner of a dog’s eye, showing the white of the eye. Dogs often do this when they’re uncomfortable. These 3 signs can be quite subtle and are easy to miss. It’s entirely possible that Corky’s cavapoo tried to diffuse a stressful situation using dog body language, but no one noticed. Learning to recognize when your dog is uncomfortable is key to keeping everyone safe. If your dog is aggressive towards children, this is even more important. → Get personalized, one-on-one help for your dog and child with help for aggressive dogs. 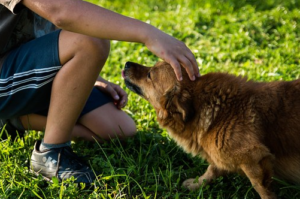 Once you’ve implemented good management and you’ve helped the child understand how to interact safely with dogs, it’s time to help the dog learn how to behave around children. It sounds like Corky’s cavapoo has previously done OK with children – but we don’t know the specifics of each interaction. Let’s start at the beginning and assume the worst. I highly recommend working with a trainer at this point. This means doing lots of counter-conditioning and desensitization. Take the dog to an area where the dog can watch children go by. A park might work. Be sure that you don’t let children greet the dog just yet. Start doing Look At That training (see a demo video here) using the children. At this stage, our only goal is to teach the dog that children = treats. We do not want the children to approach the dog. This dog looks pretty nervous. Petting under the chin might make her more comfortable with the child. We can slowly move closer and closer to the children. Again, don’t let the children approach the dog just yet. Use your management skills – keep the dog behind a fence and on a leash, or on a leash with a muzzle. If children run up to say hi and this scares your dog, you’ve just undone all of your hard work! This is why working with a trainer is important. If things are going well, you can start walking your dog past children and feeding her. You can feed your dog while children walk past her. Eventually, build up to having children approach while you feed the dog. Keep interactions short and very safe. Let children feed the dog and pet your dog under the chin. After just a few seconds, end the interaction. Keep a very close eye on your dog’s body language. Don’t be afraid to gently direct the children through the interaction. I won’t go further into training here in this blog post. There’s much more to be done here. But you need to work with a trainer at this point if your dog is aggressive towards children. I can’t say it enough. Work with a qualified dog trainer at this stage. This is true even if the interaction only happened once and your dog is otherwise very sweet and friendly. It’s just too much of a liability for you, your dog, and the child if you ignore the problem. Dogs that are aggressive towards children can live safely in many homes. Explore your options of management, training, rehoming, and euthanasia – in that order. Most dogs that are aggressive towards children can live safe lives through management and training. I would never recommend euthanasia based off of a few sentences – but we need to talk openly about it a bit here. I certainly do not recommend it in the case of Corky’s cavapoo based off of what I know so far! Your ability to safely manage your dog around children. Think about your handling skills, your environment, and your distraction level when your dog is around children. Your dog’s daily, weekly, and monthly exposure to children. The risk from a dog that lives at a daycare is different from a dog that lives with a childless couple on a remote farm. The frequency of incidents. Does your dog have issues every single time she interacts with a child or was this a first-time incident? The severity of the incident. Did your dog just growl at the child, or did she chase the child down and bite her in the leg? How deep was the bite? Learn about bite inhibition to help determine the seriousness of the situation. The triggers of the incident. Did your dog have issues after being trigger stacked, or did your dog escape your yard in order to chase children? If your dog is aggressive towards children, you have to sit down and think this through. → Get expert input on what to do next with help for aggressive dogs. 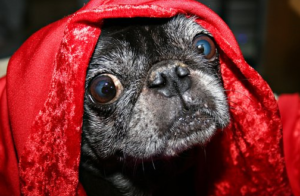 I once fostered a dog who regularly growled at children. That was fine for me. I’m an experienced trainer. I’m young and have no kids of my own. I don’t live with a family that has kids. I’m comfortable avoiding kids (management) and using training to reduce the problem. We never had any issues in the 2 months that I fostered her. That same dog later moved in with a man who ran a community garden. Families frequently visited to enjoy barbeques. The constant hubbub made management very difficult. He tried to keep the dog shut inside during barbeques, but people kept letting her out of the bedroom when they searched for the bathroom. The dog eventually ended up biting a child, and the foster parent returned her to the rescue. His management could have been better (why wasn’t the dog shut inside of a crate? ), but this home also was just not a great fit for a dog that is aggressive towards children. We constantly run into this issue at the shelter I work for. Many families end up making the difficult decision to rehome their dog when their dog is aggressive towards children. For some families, it’s just not worth the risk of management failing. Other families don’t have the time or money for training. 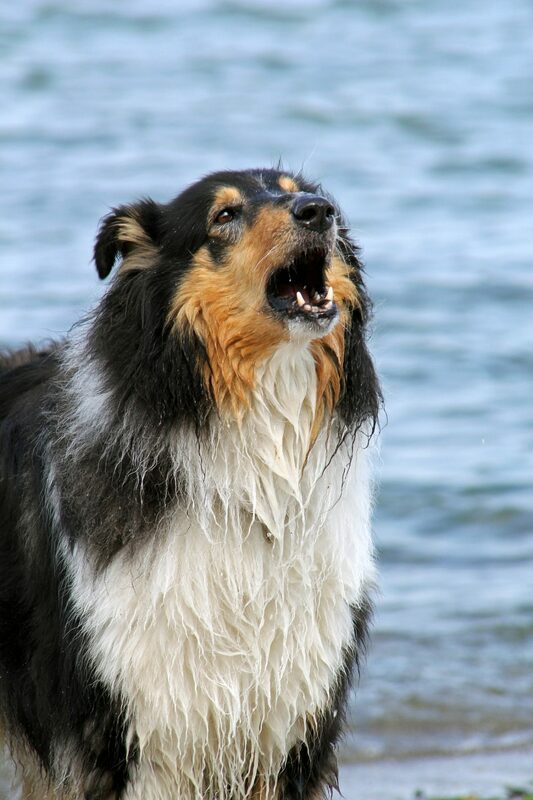 Some dogs don’t just growl, but regularly bite and snap. It’s a very personal decision that should not be taken lightly – and most families recognize that. I do not have a problem with families recognizing that training and management is not a good option for them. Rehoming isn’t ideal, as outcomes for these dogs are often not good. But I’d rather not have a child get hurt. Euthanasia is also an option for dogs that are aggressive towards children. This is an extremely difficult topic, but it’s important to bring up. In the case of the foster dog above, rehoming was a fine way to deal with the issue. That dog is now living well with some older children in a home. In the case of another dog at my shelter, the family chose euthanasia. Why? Their dog dragged their child off of a swing by her hair and bit her on the hip. Another dog bit a 14-month-old child all over the back and buttocks, sending the child to the ICU. Both of these dogs were put down. While management, training, and a better home could have worked for both of these dogs, the families and the shelter decided that it just wasn’t worth the risk. These dogs were both huge liabilities – what if they bit again? The courts would not be very forgiving to a family or a shelter that knowingly went forward with adoption for dogs that are known to be so aggressive towards children. Again, I’d never recommended euthanasia or rehoming on a blog post. Talk to a qualified trainer or veterinary behaviorist if you are worried about training and management not being enough for your dog. → Get expert input on what to do next. There are several steps towards working with a dog that is aggressive toward children. In the case of Corky’s cavapoo, I’d start out with trying to understand exactly what led up to this aggression. What was different this time? Then work to manage the situation and prevent it from recurring. In the meantime, avoid all unsupervised and unprotected contact with children. Teach the child how to interact with a dog. Take our self-study class, Keeping Kids Safe and Dogs Happy. Yesterday my 8 month old was crawling around on the floor and my 7 yr old Aussie bit him on the face. We weren’t there to know exactly what happened but we are pretty sure he probably grabbed the dogs whiskers or something near his face. This dog is aggressive naturally with other dogs but has never been aggressive towards people other than a warning bark. My husband wants to give him away. We have a 3 yr old daughter and this has never happened with her. Should we rehome or take extra safety precautions? That’s really scary, Rachel. I’m so sorry you’re dealing with this problem. I ultimately can’t make this decision for you. I can tell you that prevention can help, especially using x pens or baby gates to keep crawlers/pullers/tuggers separate from dogs. I also can tell you that if the bite wasn’t bad (didn’t break skin or barely broke skin) we’re in far better shape than if the bite was really serious. I did make a scoresheet for dogs that you might find helpful. Why don’t you fill that out and email it to me? We can chat more over email. It is possible to make this situation safer, but it is really dependent on your level of risk tolerance and skill with managing a dog and two small children. There are a lot of moving parts. yes, I would love for you to email me. I am needing some professional guidance and your the only one I have found so far. Thank you! Hi, I have a 2 year old dog who is not good with children. He has never bitten. But he does bark and lunge towards children who specifically approach him. We have not friends with children to train him with but we pive next to a school and play with him on leash there. And train him there. He normally ignores kids but when the pay attention and approach he lunges and barks. We want to have children but am afraid about approching the possibility with him. I do notbwant to rehome him, we have muzzle and crate trained him. He loves his muzzel and we hope to keep training him with kids when we find people willing to let us train him near the children. Any suggestions. We want to start a family and we really want to make this work. We love him and would hate to rehome him. But childrens safety is our top priority. Is ot irrisponsible to start a family in hopes that he will with the daily exposure and training get accustomed? Hi Lindsay! I’m glad that you’re thinking about this now before you start a family. It’s definitely possible to make things work, but it can be a lot of work. I would definitely want you to work closely with a trainer before you start a family, and don’t just hope that things will get better with exposure. If you’d like some help from me getting started, I’m always here! I offer video training that would be a good foundation for the upcoming work, but ultimately you’ll need to work with a private in-home trainer for this. Hi, I have a 10 month old Aussie/Catahoula mix and a 3 year old Golden retriever. The golden is great with kids. The aussie is sometimes but then other times not so good. She had never bitten but she had snapped for no reason, the kid was just walking by… I don’t have kids of my own but have at least 1 kid at my house regularly, so she is around kid regularly. The times that she has snapped it was when we had a group of friends over and there were several kids over playing. She does good for awhile with the kids but after awhile she is ready to be done. The dogs are crate trained and I’m wondering if it would be best to crate after a little while so she can have some down time. She does act a little nervous when there are a lot of ppl in our house but it’s not real nervous if that makes sense. What are your thoughts? Hi, Kayla! It sounds like your Aussie is a lot like many herding breeds- much more sensitive to commotion than your average golden. When you notice that your Aussie is ready to be done, I’d suggest putting her away with a chew toy. Same goes for when people are over! My border collie generally needs a walk, crate time, or chew time when we’ve got people over, too. If you need more help, I’m here! We have a 2 year old dog and she has recently started growling at our 6 year old yesterday she is great with everyone else including our 3 year old and my wife is prego with a third. Concerned she has just started growling at her anytime she walks by or tries to pet her. Hi Frank. I agree, I would definitely be concerned as well. What have you tried so far to make your dog feel more comfortable around your 6-year-old? Do you think there’s a reason that the six-year-old is more concerning to your dog than the 3-year-old? Hello! I’ve had my 3 year old dachshund mix for 2 years. She gets aggressive and has item guarding tendencies. I manage her very well on my own, but I’d like to start a family in the distant future and I’m worried she’ll bite if a young child can’t read the signs that she’s guarding something. In your experience, is item guarding manageable? Can you send me that scorecard as well? We had the exact same thing happen to us. Hello! My boyfriend and I have a 7 year old lab/boxer mix who is amazing with kids, we also adopted last year a now one year old lab/Aussie mix. He’s only been around some family kids and is usually fine but once in a blue moon decides to snap at the smaller kids (3 and 7). not sure if it’s got something to do with their size or what. He starts with a growl then lunches with his front paws first. In the first few cases he’s left no mark, but he recently left a (scratch or bite – not sure) mark on our friends 3 year old. Our friends child went to pet the top of his head making our pup uncomfortable I believe causing the growling. At which point I went t grab My dog and he lunged at the child. Our pup is super loyal to me specifically, so for some reason this always happens when I’m right there and sitting.’ Down…I’m so used to having my all around easy going lab that this is all new to me. Any advice you can give us much appreciated! We want our pup to behave and feel comfortable around the kids! Hi Katherine! I would start with the suggestions made in the article above – stop allowing the dog and child to access each other and work on desensitizing the dog to the children. It’s best to do this with help, and I’d highly recommend booking a call with myself or another Certified Dog Behavior Consultant for help! We just rehomed a 6-month old Pitsky from the friend of a friend 3 days ago. She immediately attached to me, and is generally loving and playful when I am around, but when I leave she often retreats to her crate and growls/barks at my kids (9, 5, 2). My wife wants to give her away to someone, but I think she is just uncomfortavle with my kids being so forward during this time of stress and uses my side as her safe place. Additionally, she tends to deliberatley potty in the house when my wife attempts to take her outside. I have been having the kods feed her, give her treats as reward, and pet her under close supervision to try to warm her up, but again, she reverts as soon as I leave to work. Is this normal? I am not sure how kuch more time I should give it before digging into my wallet and seeking professuonal help. Hi Damien! Thanks for reaching out. This isn’t exactly normal or ideal behavior, and it’s always going to be easier for a professional to help earlier in the process when things aren’t too bad yet. I’d suggest getting help now so that you can nip any problems in the bud, rather than waiting until you’re at your breaking point! Hi. I have a 10 month old yorkie x Jack Russell who’s been brought up with my four children aged 13, 12, 9 and 18 months. She’s usually very calm around my 18 month old…..she reacts well to him cuddling her and we’ve taught him to be gentle. This evening she was sat on my knee dozing and he toddled across the room to cuddle me…..she growled and nipped his hand. No blood or even marks but it made him cry and is worrying nonetheless. Is this her trying to oust him in ‘the pack’, and if so how do I deal with it? Thank you in advance. Hi Viki! I just announced a new course (Keeping Kids Safe and Dogs Happy) that will be perfect for you guys. For now, I’d just toss treats AWAY from you if your dog is near you and the toddler approaches. That will get her away from you and keep your 18 month old safe. Avoid punishing her, as that might teach her that the toddler is what makes Mom punish her! Hello, my partner and I have a 6 year old pomoranian cross Jack russell. She is a very happy and playful dog but does have an aggressive side. She is usually great and is a very cosey lap dog. She loves us cuddling her and always listens when going for walks and is also fine off the lead around people and other dogs. Though on the other side of things.. if our house mate tries to put her outside, she tries to bite her. She won’t let anyone pick her up if she thinks they are going to put her outside if she doesn’t want to go, unless its us (her owners). Other than that, she is fine with adults. She doesn’t like children. She will let other people pat her if she’s sitting on the couch but if there is a child who is patting her she will try to bite them. We are very careful, we sit next to her and make sure our hand is close to her face (just on case) and tell her she’s a good girl when our neice is here and patting her. But today, my neice and nephew at two separate times, walked up to her to try and pat her and she jumped up to bite them. We don’t know what to do from here. Is there anything you could suggest? Hi Mary. Have you been able to implement some of the management strategies and desensitization protocols outlined in the article above? We have a 1.5 year old cavapoo who growls a fair amount at my 4 kids. Especially the younger two (age 7 and 4). I realize from reading your article that we need to do a few things differently to teach the kids how to interact with the dog. Hugging is definitely part of this. However, my question is about what to do when the dog is on my husband’s lap and a child comes up to the dog to interact. Even if no hugging is involved, our dog will growl before the child has touched her. What can we do to stop this behavior? Also is there a way to tell the difference between a play growl and a warning growl? I would love some suggestions on how to manage the growling, thanks ???? Hi Kel – I sent you an email about our upcoming online course for dogs that are aggressive towards kids! Hi Swetha – I can’t really fix that in the comments section of this post. I’m currently running a 6-week online course for dogs that are aggressive to kids, or you can book a private call with me. For now, you need to start muzzle training your dog and keep her 100% separate from all children. Put a sign on your door and be prepared to put her in a crate if kids visit.